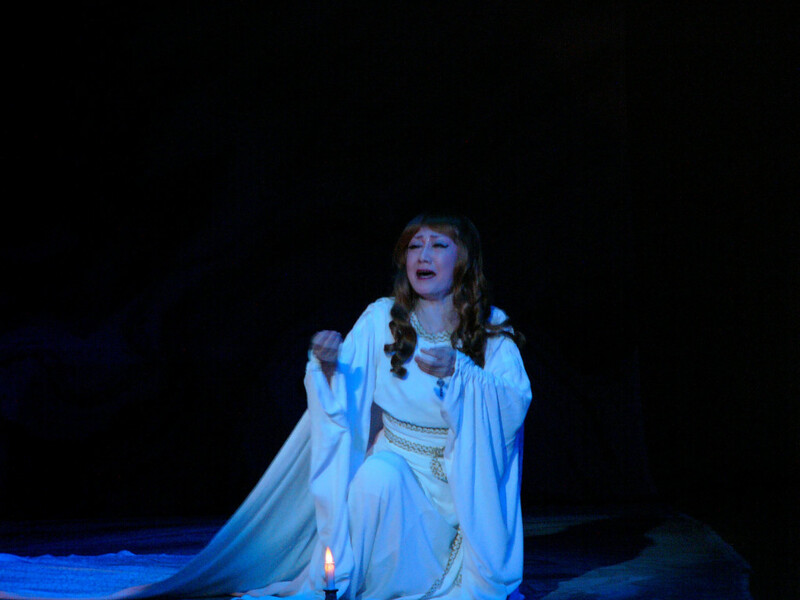 * Zhang Ping from the Henan Yuju Theatre. 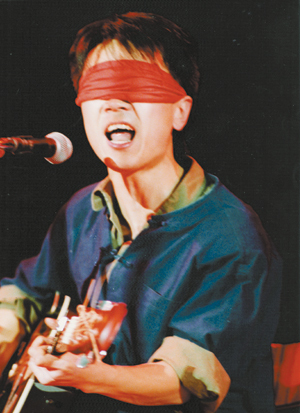 On top of this, there will also be an exhibition of 10 different productions of ‘The Orphan of Zhao’. 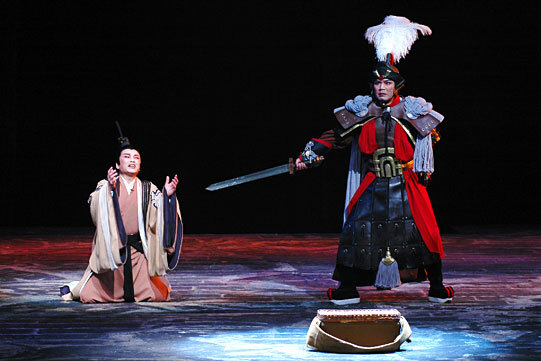 The productions cover different genres of Chinese spoken drama, four local operas, Western style opera, English and Korean. 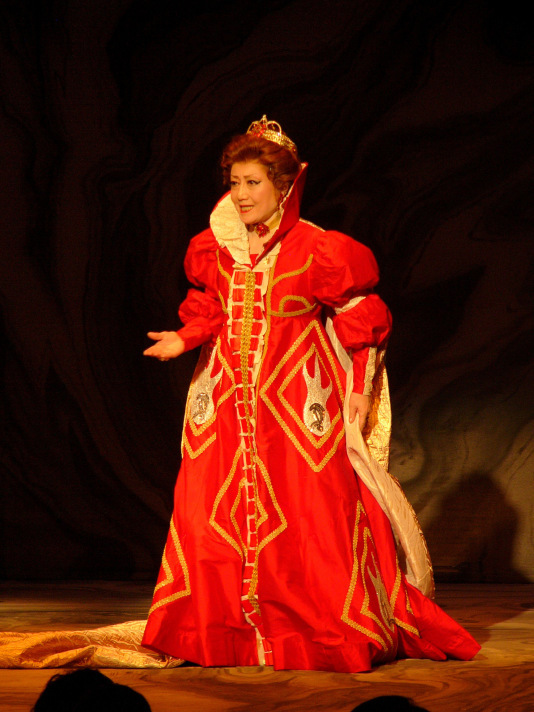 There will also be two workshops on the 27th led by the Royal Shakespeare Company and the National Theatre of China. Spaces for these are limited so book your place now!! (Details attached) ‘Stage@leeds’ is the performance building situated at the University of Leeds (Woodhouse Lane, Leeds, LS2 9JT). There will be signposts on the day to guide you to the venue. Please note: It is advisable to book your tickets in advance. The event is bilingual (Chinese and English), subtitled or interpreted live by our MA Translation students. For anyone interested in Chinese theatre, including the controversial The Orphan of Zhao at the RSC, check out this two day symposium at the University of Leeds organised by Dr Li Ruru. It promises to be a stimulating and fun. The second half of my Orphan review is still pending…. Watch this space… Read the first part here. 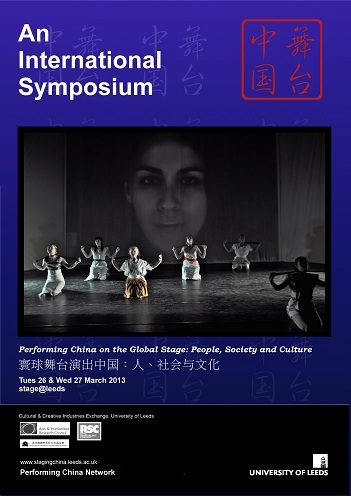 ‘Performing China on the Global Stage’, a practice –led research network with its hub in Leeds, announces a two-day international symposium on 26 and 27 March 2013. The symposium will include both conventional research seminars and public events of workshops and interactive presentations. Scholars and practitioners attending the symposium are from mainland China, Hong Kong, Taiwan, Japan, Australia, North America, the UK and other European countries. Discussion among contributors of the proposed book (Chinese) led by Professor Hu Zhiyi (Zhejiang University): Chinese Image: An intercultural Study of ‘The Orphan of Zhao’. Discussion among the contributors of the edited book (English) led by Dr. Li Ruru (University of Leeds): Spoken Drama Productions in the Millennium: Theatrical Encounter with Politics, Society and Culture. Much Ado About Nothing – a workshop led by Zoë Waterman, Assistant Director from the Royal Shakespeare Company UK. (Maximum participants 30). An exciting opportunity to explore this Shakespearian comedy, using classical British rehearsal room techniques to get inside character, language and storyline. 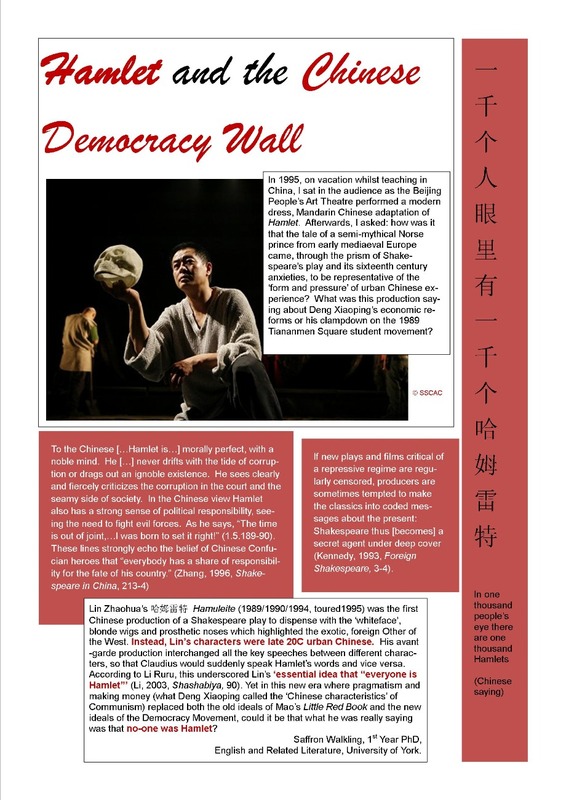 Energy: Essence of Chinese Theatre – a workshop led by Director Tian Qinxin from the National Theatre Company of China. (Maximum participants 20). Focusing on eyes and the physicality of human beings, the workshop explores the function of energy in creativity and in reactions between performers in the Chinese style. Closed meeting of contributors for edited book (Chinese) to agree on the extension of the detailed outlines into chapters, and time line. Closed meeting of contributors for edited book (English) to agree on the extension of the detailed outlines into chapters, and time line. Open panel for network partners to discuss how to take forward the project currently called Performing China on the Global Stage, including the electronic stage production repository, PG network, future live performances. 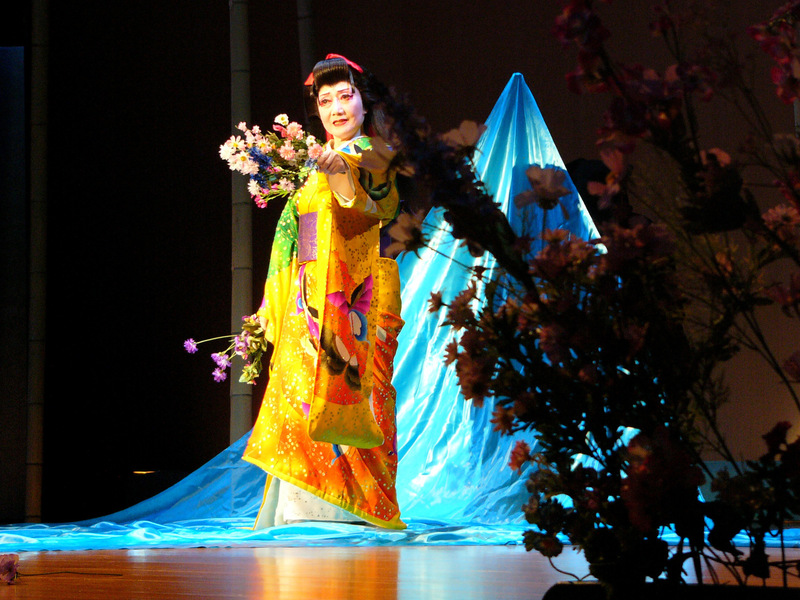 Staging China, an interactive presentation by theatre professionals and researchers. Stage productions of The Orphan include a wide range of forms: Chinese spoken drama, Chinese regional opera, Chinese Western-style opera, and the current English production by the Royal Shakespeare Company. These works will offer evidence and study cases for the examination of intra/inter/cross-culturalism, challenging the existing models and methodologies. Productions by the West Yorkshire Playhouse, University of Leeds, Border Crossings, University of Hawai’i at Manoa, National Theatre of Scotland and of the play Chinglish will be presented and discussed. An exhibition of images and video in the venue foyer will provide a virtual theatre experience via over a dozen stage productions. Please wear comfortable clothing and soft-soled shoes for the workshops. Places are limited and need to be booked in advance. Would like to attend the Open Sessions from 10.30 at a cost of £12 (£6 Concessions) including lunch. The Orphan of Zhao adapted from the Chinese by James Fenton and directed by Gregory Doran, The Swan Theatre, RSC, Stratford-on-Avon, 3rd January 2013. “Unavoidably, the production raises the question of ethics, not just the ethics of representation, which concerns the decontextualisation of an epic from its history and culture, but the ethics of interacting with people … in the process of creating the work itself. 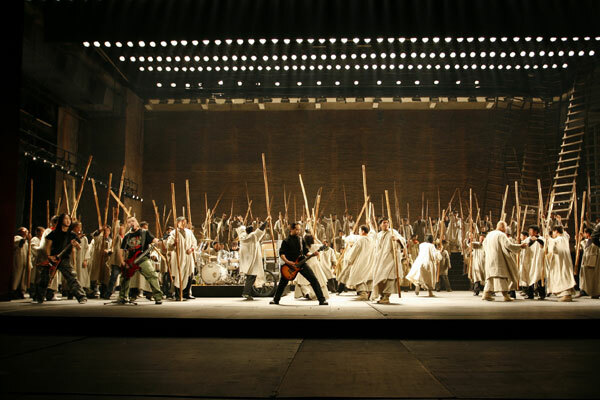 … It is at the level of interactions that the human dimensions of interculturalism are, at once, most potent and problematic.” Theatre and the World: Performance and the Politics of Culture ( 1993) p.84. The quotation in context refers to Peter Brook’s Mahabharata but can, I think, be usefully applied to the RSC’s The Orphan of Zhao. Interculturalism is a sticky issue, caught somewhere between liberal diversity politics and post-colonial reclamation of identities and narratives, as seen in the polarised responses to Brook’s and, more recently, Gregory Doran’s forays into appropriating non-western world literature for western consumption. Minority groups rightly feel aggrieved at under-representation or misrepresentation. The companies accused of insensitivity in casting when they have produced a previously unperformed ‘non-western’ play on a mainstream western stage may well feel that they are unfairly singled out: identifying themselves as liberal and open to diversity, they wonder how they have ended up labelled as the neo-imperialists? I’m going to confess that I was entertained and frustrated by this production in equal measures, and I hope that I can write of it here with some generosity, despite my very serious reservations… Thus, for my response to The Orphan of Zhao I propose to take as my starting place the interactions that are the ‘human’ dimension of intercultural performance through all that was ‘most potent’ and ‘most problematic’ for me in Doran’s production at the Swan Theatre. 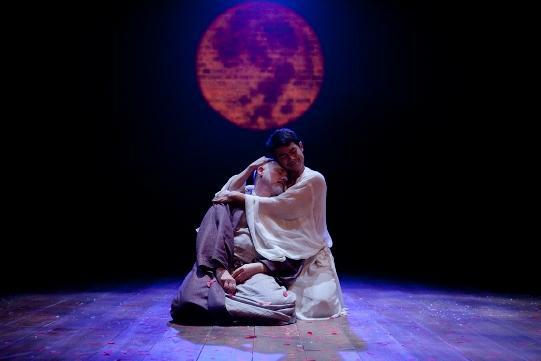 The Shakespeare connection for this play in the RSC’s A World Elsewhere season is the claim that it is the ‘Chinese Hamlet’. After all, anything ‘foreign’, it seems, must be made comprehensible through something we are familiar with already, even though that comparison may distort it completely. This is a paradox that Shakespeare plays with in Antony and Cleopatra. When Antony returns to Rome from the ‘exotic’ East, his drinking buddy and fellow triumvirate, Lepidus, asks him what a crocodile looks like. His answer, although true, is useless as a meaningful description: ‘It is shaped, sir, like itself; and it is as broad/ as it hath breadth: it is just so high as it is,/ and moves with its own organs’ (Act 2, Scene 7) However, although The Orphan of Zhao is not actually very like Shakespeare’s tragedy, other than its central protagonist needing to avenge his father’s murder by an uncle-figure, it does bare some parallels with the ‘original’ Hamlet story from Saxo Grammaticus’ Deeds of the Danes, in which a very young Viking prince, Amleth, must live in his fratricidal uncle’s household until he reaches manhood. At this point, as a dutiful orphaned son, Amleth kills him. Likewise, the Zhao Orphan, whose father is a court minister, and whose mother is the Emperor’s daughter, must also grow up to enact his revenge when his father and his clan are wiped out by a jealous rival minister, Tu’an Gu. In both the tale of Viking Blood Revenge and the musical drama of Chinese filial piety, the call to vengeance is never questioned. The tension lies in whether or not the boys will manage to survive into adulthood to fulfil their duty. Coincidentally, the first extant version of Orphan, by the Yuan dynasty’s Ji Junxiang (紀君祥), was written at about the same time as Deeds. James Fenton’s adaptation succeeded in making a potentially confusing tale of corruption at court, babies switched at birth, the slaughter of infants, a mad woman locked away in a hidden palace, and divided filial loyalties, flow with a simple clarity. I didn’t notice that much poetry in the translation, but I never lost track of the plot or themes, and the songs were simple yet compelling. One of the central conceits is that the family doctor switches his own baby son to protect the prince. To prevent the Herod-like murder of all boy-children under the age of two, he must reveal the whereabouts of this supposed Orphan of Zhao. 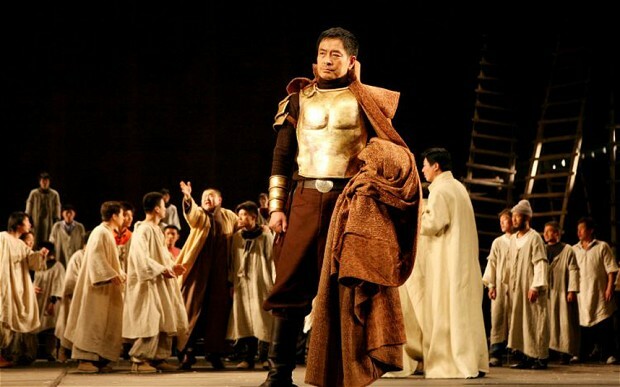 The doctor’s baby then has his little neck broken on stage in front of his father by the murderous Tu’an Gu, who believes it to be the orphan of Zhao. Tu’an Gu, as a reward for [the doctor’s] ‘good’ deed, decides to adopt his son, unaware that he is the orphan’ (Programme, 2012: 22). The Swan Theatre is my favourite space at the RSC, because it is so small that the action is close and clear even when I am in the ‘cheap’ front-row second gallery seats (still very pricey at £22 for non-concessions). The Orphan of Zhao worked well in that relatively intimate thrust-stage environment, as the actors happily hammed up ‘speaking to the audience’ and ‘introducing their roles’, presumably in reference to various Chinese opera traditions. Yet these were fine performances. 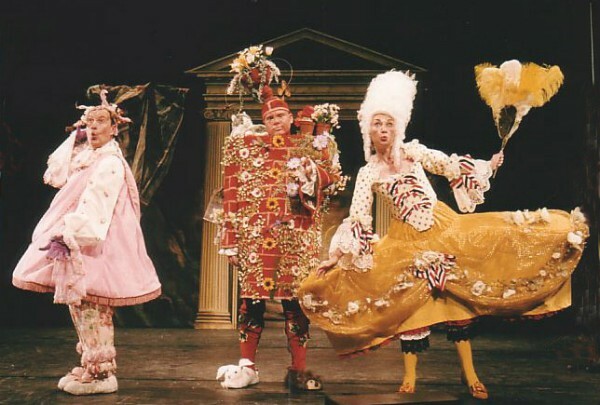 This was the only production in the World Elsewhere trilogy to cast two ethnic minority actors in protagonist roles, the hero and the villain, proving that a major British classical theatre company risks no threat to their artistic reputation by foregrounding talent from a broader spectrum than is the norm. Joe Dixon, who I had previously seen at the RSC as Aaron in Titus Andronicus, was a deliciously roguish Tu’an Gu. As for Jake Fairbrother as the grown-up orphan, Cheng Bo, I couldn’t help but think that he had been cast in part, at least, because of his uncanny resemblance to a young Yul Brynner… Like my daughter, labelled ‘ethnically ambiguous’, the director clearly felt that Jake, too, had a face that could represent anywhere. Cheng Bo’s childlike energy and innocence was delightful and all too fragile in the face of his task when, suddenly discovering his true identity as he reached adulthood, he found himself bound to execute the man he had loved as a father. This was one of the productions strengths: it did not shy away from the ambivalences of the plot. Nia Gwynne was simply heartbreaking as the doctor’s wife, lamenting the sacrifice of her precious child because of some supposed ‘greater good’ before falling into despair and disappearing. This scene was made even more potent because, as the fate of the two babies was debated by the doctor and his wife, the baby dolls were ‘voiced’ by adult actors kneeling on either side of the stage. Chris Lew Kum Hoi, who would later return as the ghost of the doctor’s son was one of them, his cooing and gurgling in stark contrast to the adult body that would be denied him. Unfortunately, the implications of this scene were not fully realised as instead of having Fairbrother produce the sounds of his infant self, this was voiced by another actor. 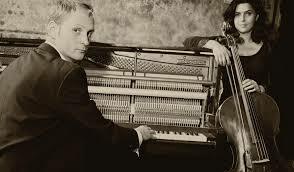 Lots of old white men played old Chinese Mandarins, but with sagacity and grace. 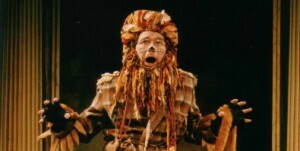 Susan Momoko Hingley, an Anglo-Japanese actor, did a sprightly turn as the soon-to-be decapitated maid, and Chris Lew Kum Hoi stunned us all as he returned as the ghost of the doctor’s son in the final five minutes. In a pair of scenes that echoed each other, the Orphan and the ghost confronted the men they saw as their fathers. Cheng Bo offered Tu’an Gu the same option of ‘suicide’ as Tu’an Gu had offered his real father. Unable to take his own life, Tu’an Gu begged his adopted son to kill him if he had ever loved him. Thus this ‘patricide’ became, not simply a moment of revenge, but also a brief moment of possible forgiveness. In contrast, the old doctor, confronted by the son he had sacrificed in a graveyard, found he must kill himself to appease the child he had abandoned. It was a beautiful production, too. Whenever somebody died, blood-red petals fell from the rafters. A latticed moongate and red silk lanterns evoked Old China throughout: the Swan Theatre had transformed overnight from pre-Revolutionary Russia (Boris Godunov) to a pretty good impression of The Lao She Teahouse in Beijing. In traditional Chinese theatre, scenery is minimal and non-representative. The RSC had done some research: a week in China for the director and designer, plus artistic advice and workshops on Chinese stage conventions ‘back home’ led by Leeds University academic and director, Dr. Li Ruru, author of Shashibiya: Staging Shakespeare on the Chinese Stage and The Soul of Beijing Opera. Her introduction in the programme to the evolution of The Orphan of Zhao’s stage history, both in the East and in the West, is illuminating. Tian Yuan Tan of SOAS also adds credibility with his article on dysfunctional dynasties. Full colour spreads of Terracotta Warriors, Spirit Ways, Pagodas and Dragons all make clear that we should not expect a hybrid or an anglicised production: this is the RSC introducing the British public to Chinese Theatre. The delicate watercolour designs by Niki Turner shimmered into life in a production awash with coloured silks and shining spears. Authenticity seemed to be the order of the day, from the Emperor’s imperial yellow robes and pointy black beard, to a wise old Mandarin physically prostrating himself in front of the spoilt monarch (who had been practising his archery skills on his subjects for fun) as he desperately tried to make him see reason. 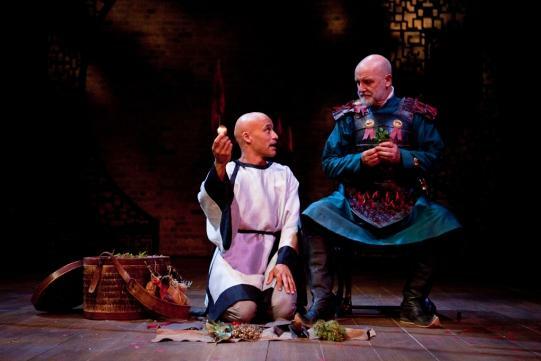 Roundtable discussion: Interculturalism, universality and the right to representation in the RSC’s The Orphan of Zhao. Friday 23rd November, 3-5pm, Centre for Creative Collaboration, Acton Street, London. Orphan of Zhao update and roundtable. My own review of the production, and the aspects I found both most potent (there was much that was potent and beautiful) and most problematic (there was much that was problematic), will be coming soon. The weekend (15-16 December) was interesting. After some intense conversation on the use of blackface in opera, media responses to this phenomenon and related issues, I went to the cinema to see a production of Verdi’s ‘Aida’, beamed live from the Metropolitan Opera House, New York. Wonderful singing, but of course, in an opera which does not have a single white character, there was not a single black artist in a principal role, and the two Ethiopian characters, Aida and her father, were in dark makeup, to differentiate them from the Egyptian characters. I looked on the Met’s website to see their casting for this season. In a season of 29 full scale opera productions (including an ‘Otello’ – yes, white tenor in blackface), there are maybe 5 people of colour named in principal roles on the website. One African American artist, one East Asian and a small handful who would maybe identify as Latino/Hispanic. Does this represent the balance of available talent? I doubt it. Carol Chillington Rutter’s chapter ‘Shadowing Cleopatra’ in her book Enter the Body: Representations of Women on the Shakespeare Stage challenges us to stop and think about the extent to which we accept without questioning traditional casting practices – and looks at the tendency of liberals to defend or justify these practices. 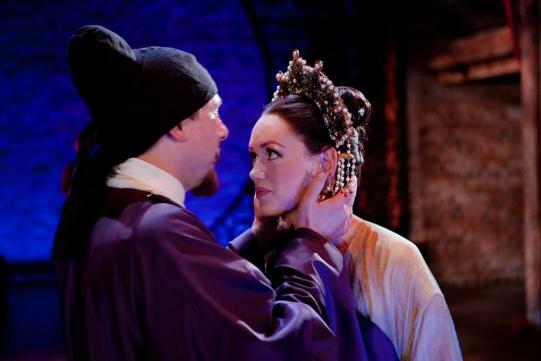 * Amanda mentions that none of the RSC team who were invited to the roundtable came, but for the record I would like to note that my friend Dr. Li Ruru was touring China at the time with a group of Leeds University student actors performing Cao Yu’s The Sun is Not for Us. Ruru and I may take different positions on the casting of the RSC production, but she works tirelessly to promote Chinese theatre in British academia and beyond.